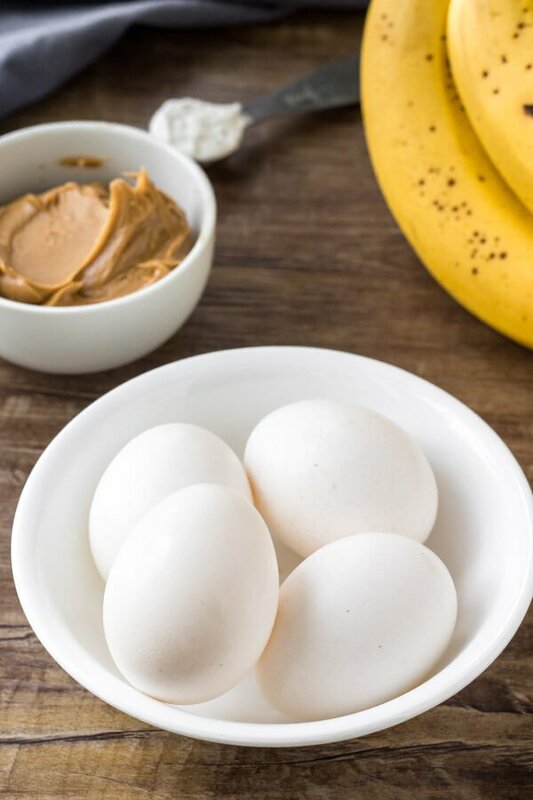 This post is a paid partnership with Egg Farmers of Canada. As always, all opinions are my own. Thank you for supporting my blog and helping me work with organizations I love and believe in. Peanut butter for delicious peanut butter-y goodness and some extra protein. 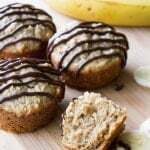 You can really use any nut butter that you prefer. A little baking powder to help them rise. And eggs. Eggs provide structure to any kind of baked goods. 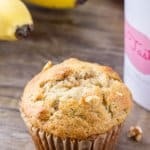 They also add moisture & tenderness, AND they add extra protein to your breakfast. (Talk about a win, win, win). 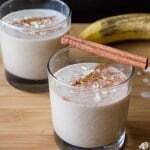 All the ingredients go in the blender, then pulse until smooth. You can also simply mash everything together in a medium bowl using a fork if you prefer. Then on a hot, lightly greased griddle pour scoops of batter. 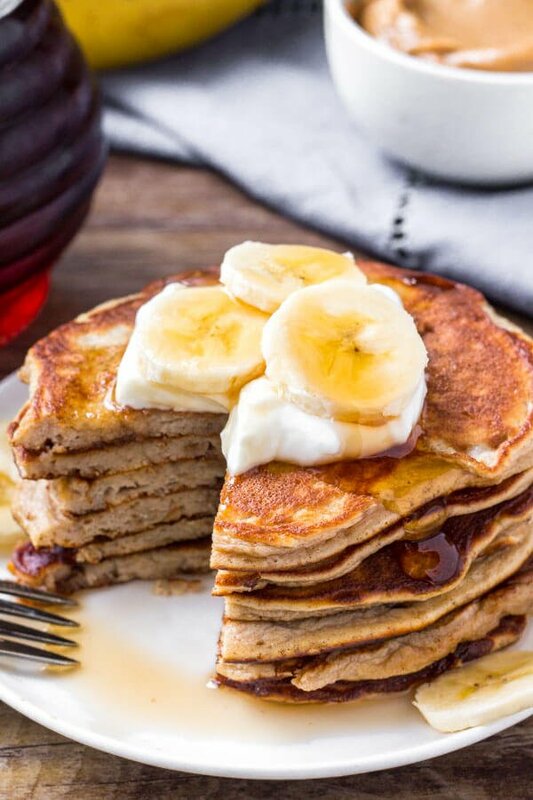 The only trick to this recipe is to make sure your pancakes aren’t too big. A scant 1/4 cup of batter per pancake is more than enough. Because the batter is thin, if you make your pancakes large they can be a bit of a challenge to flip. Fry the pancakes on one side until you see a few little air bubbles forming, then flip them over and cook on the other side for about 2 minutes. 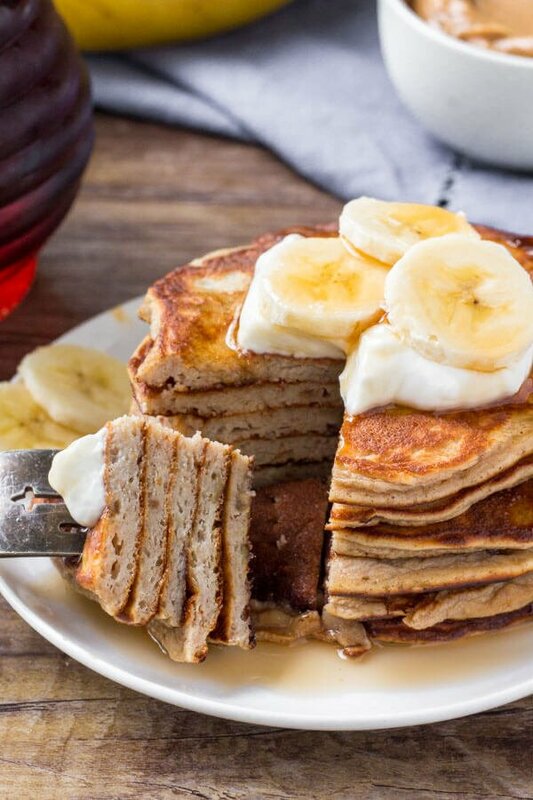 And voila – you’ve got delicious, 10-minute peanut butter banana pancakes to enjoy. 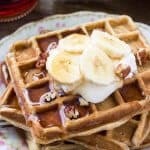 They’re delicious plain, or with a spoonfull of vanilla yogurt, peanut butter or jam. I decided to enjoy mine with a spoonful of vanilla yogurt, a drizzle of maple syrup and a few chopped banana slices. Whether it’s World Egg Day or any day of the week – there’s so many delicious ways to enjoy eggs. To be honest – eggs are a staple in my house. Between eggs for breakfast, the occasional quiche for lunch or supper, and tons of baked goods – we go through a lot. And what I love about Canadian eggs is that I can always feel good about what I’m buying. Canadian egg farmers take pride in providing the highest quality eggs for Canadian families, and provide exceptional care for their hens. And matter where you live, your eggs are from a local farmer. There are Canadian egg farmers in every province. With over 1000 family egg farms across the country – when you buy Canadian eggs you’re supporting a local farmer, and getting the freshest, highest-quality eggs. 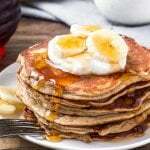 These 10-minute peanut butter banana pancakes are such an easy, delicious way to enjoy eggs for breakfast. How will you celebrate World Egg Day this year??? Make sure to enjoy your eggs and share your favorite egg recipes on social media by using the #WorldEggDay hashtag. To learn more about Egg Farmers of Canada – including tons of delicious recipe for World Egg Day on October 12th – make sure to visit their website at www.eggs.ca or follow @eggseoufs on Twitter or Instagram, or like Get Cracking on Facebook. 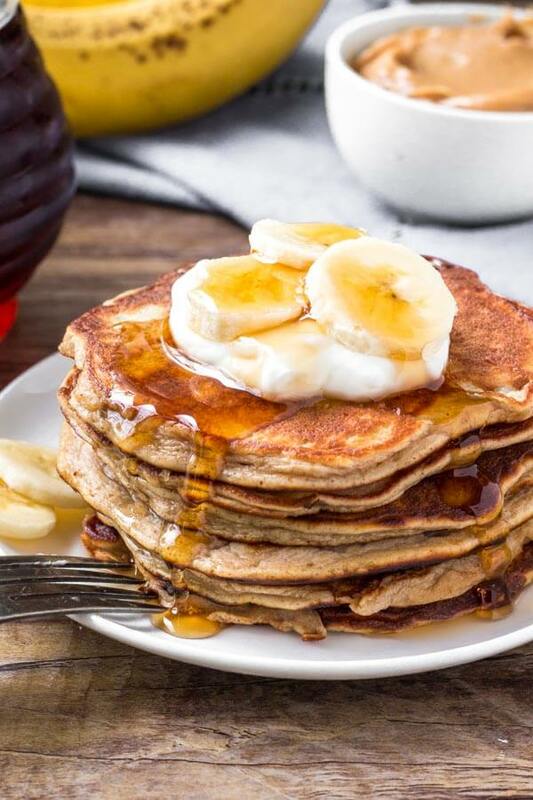 These easy Peanut Butter Banana Pancakes have soft & fluffy texture, delicious peanut butter banana flavor, and only take 4 ingredients and 10 minutes to make. 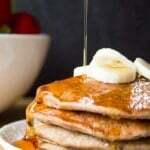 We love banana pancakes, but I’ve never made a peanut butter version. Can’t wait to try your recipe, they sound delicious! 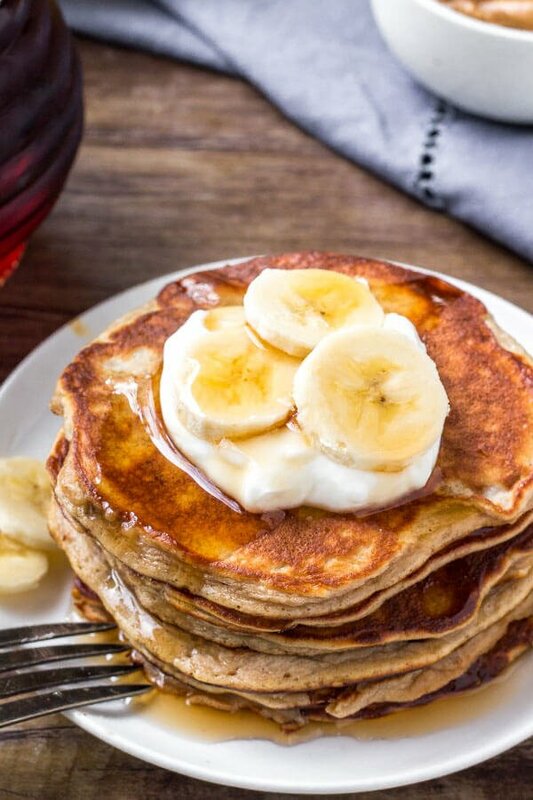 These Peanut Butter Banana pancakes are a great alternative to just regular pancakes! We loved them! Love how quick and easy these are!! !